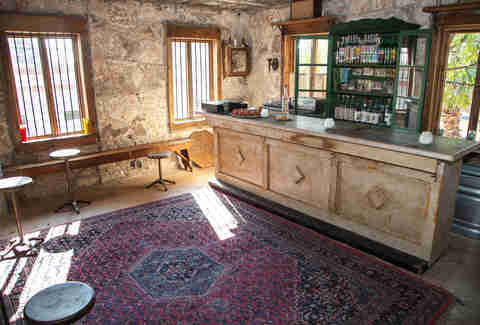 The “members first” cocktail den caters only to its members and their guests but prospective members are allowed one visit before they’re required to pony up the $500 yearly membership fee. Although we can’t disclose the address, we can direct you to the bar’s app, which is used to apply for membership and book reservations. Make it past the keycode gate, check in with your doorman, then expect to be greeted by a giant bear holding a tray of Champagne flutes and led into the low-lit space to your seat. The menu is inspired by flavors found around the world- -- Russia, Scandinavia, and France are just a few of the regions represented on Here Nor There’s outstanding menu. How to get in: Visit the website or download the app, apply for membership then pay the fee or request a trial visit. 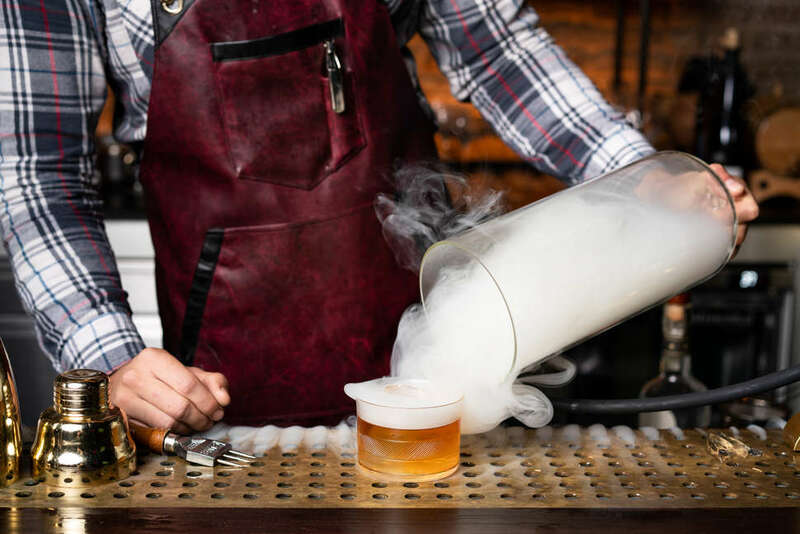 Inspired by the Prohibition Era, The Whisper Room just opened at The InterContinental Stephen F. Austin hotel on Congress Avenue, which opened in 1924. 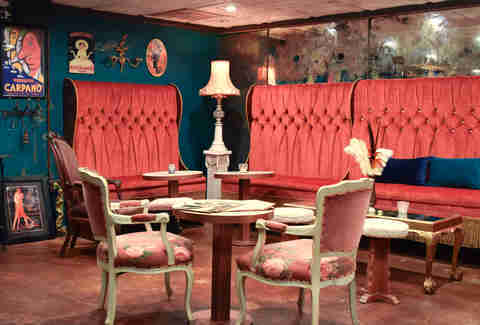 The 10-seat, reservation-only bar is found within the hotel’s existing restaurant behind a red velvet curtain. 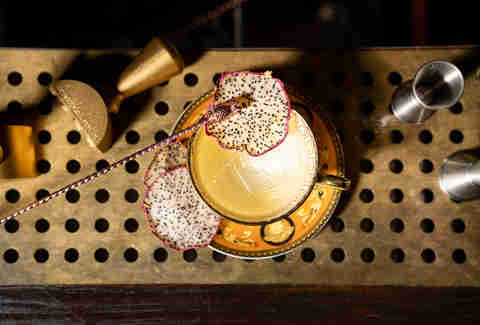 The 1920s-themed bar serves a menu developed by acclaimed barman Justin Elliott (formerly of The Townsend and Juniper) and consists of modern takes on tried-and-true classics like the Old Fashioned and Sazerac, made tableside on a 1930s Aldo Tura bar cart. How to get in: Reservations can be made by calling the hotel at 512-721-4230. The lounge is open Monday to Friday from 3 p.m. to midnight, Saturday from noon to 2 a.m. and Sunday from noon to 11 p.m.
At Buenos Aires Café, a majorly date-worthy Argentinian eatery, you can now enjoy a nightcap and a flamenco performance at the secret basement bar, Milonga Room. 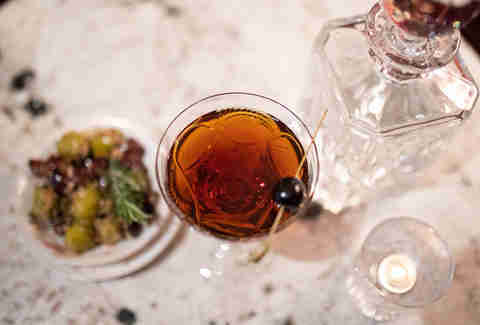 The menu includes tapas and wine, but the spotlight is on amaro and fernet-focused cocktails, as these herbal spirits are major players in Argentinian drinking culture. How to get in: Walk around the back of Buenos Aires Café, and knock on the blue door Emerald City style. Reservations are recommended to guarantee entry. 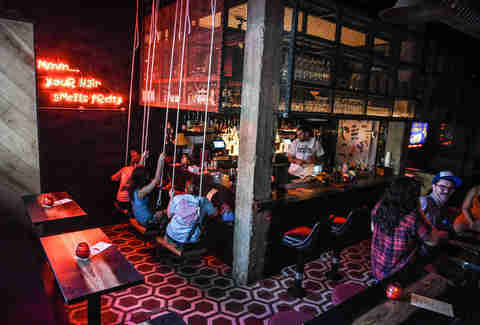 East Side mezcaleria Techo -- from the owners of Mi Madre's -- specializes in traditional consumption of the smoky spirit. Sip on copitas of single village mezcal in the very private, candlelit niche, or opt for a cocktail like the always popular mezcal margarita. How to get in: Find the staircase accessible from the patio of Schoolhouse Pub. Enter Techo (Spanish for “roof”) and be transported to a place where the mezcal runs like water. Red Headed Stepchild, Austin’s bro-friendly secret bar, is essentially HandleBar with a superiority complex -- in a good way. 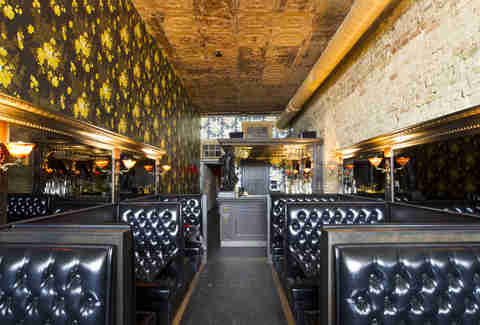 Whereas other speakeasy-inspired bars focus on bar technique and hospitality, the ‘Child thrives on exclusivity. Access requires knowledge of the ever-changing numeric code, and you won’t be allowed to shuffle in behind another group without knowing it. Beyond the keypad and “Floppy Disk Repair” sign lies a shoebox-sized bar with whimsical touches everywhere -- giant swings, a neon sign that reads “mmm... your hair smells pretty,” as well as cocktails that don’t want to be taken too seriously. How to get in: The (red-headed) owner of this bar wants it to be a legit word-of-mouth system. So, ask around! And, once you’re in, answer a series of questions, add your number to a list and you’ll be notified via text when the password changes. You wouldn’t expect a fine cocktail to come from a spot that was (until recently) advertising modeling and oriental massage, but at Midnight Cowboy -- if you follow the proper process -- you can get some of Austin’s best cocktails made by Austin’s top bar talent, hidden in plain sight in the heart of Dirty Sixth. Midnight Cowboy’s new, global-inspired menu is about to drop, and it’s is a trip around the world you do not want to miss. How to get in: Head to the speakeasy’s website to make a reservation, or if the red light bulb is illuminated, walk-ins are welcome. Then ring the buzzer marked “Harry Craddock” for entry, and get ready to enjoy a damn-good drink. While the Continental Club requires no introduction (or directions, given the iconic neon sign), the Gallery is a little less of a landmark. The Continental’s upstairs companion bar offers music, art, and mixed drinks in a far cozier environment than that of the main institution, and is easily accessible if you know where you’re going. How to get in: Head a couple of doors north of the main entrance, and up the stairs. How to get in: Head to the bookshelf in the hostel’s reception area, and slide it open. 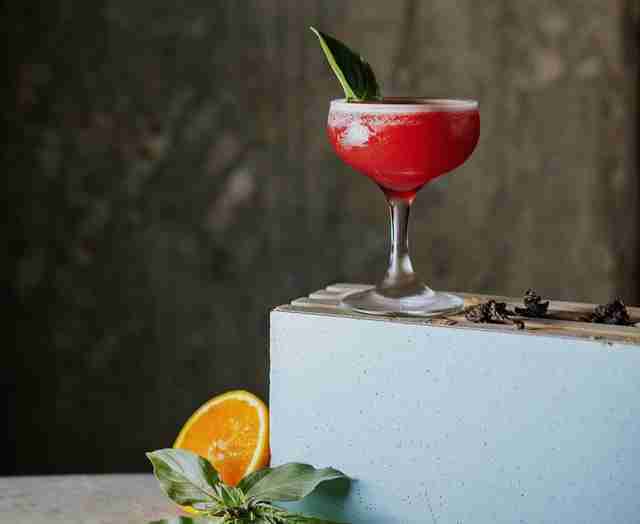 Typically, the only drinks being consumed in parking buildings are those of the paper-bagged variety, but Garage turns the tables and slings crowd-pleasers like the rosemary-infused Indian Paintbrush, which was crowned the Official Drink of Austin in 2015. How to get in: Head into the parking garage on the northeast corner of Fifth and Colorado, where the word “cocktails” quite fittingly marks the parking garage and a neon sign marks the bar’s entrance. While this watering hole isn’t exactly heavily concealed, if you were to never venture up the stairs to the area above Whisler’s, you’d never know it existed. The second-floor spot is cozy and quiet, with stone walls, a few stools, and a thick slab of bar; in terms of drinks, it’s all mezcal, all the time. 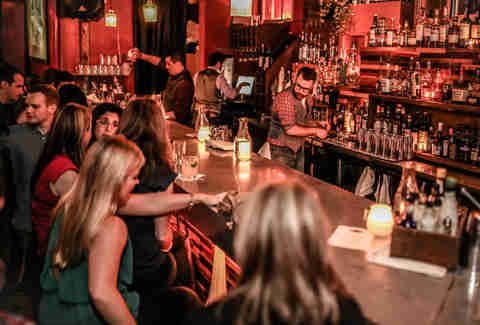 Basically, if you’re looking for a low-key evening on the East Side (and want to indulge specifically in this unique, smoky spirit) consider Mezcalería Tobalá the perfect spot to do your sipping. How to get in: Just head up the staircase found on Whisler’s patio! Consider Bar Ilegal a bar within a bar, easy to spot when you head outside at Clive Bar but invisible from the street. 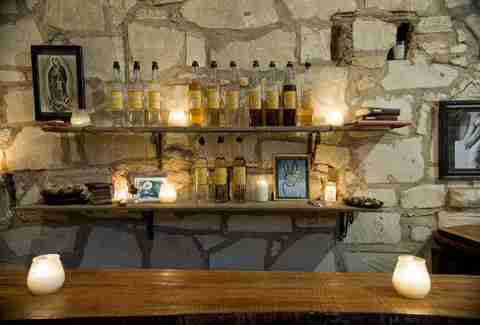 Located right in the backyard, the tiny candlelit stone cottage is yet another watering hole from Austin's Bridget Dunlap, the brains behind establishments like Lustre Pearl and Container Bar. Bar Ilegal specializes in artisanal mezcals, mezcal-based cocktails, and serves as an excellent respite from rowdier Rainey Street bars. How to get in: Head to Clive Bar’s back patio. You’re there. Bar Ilegal is only open on Thursday through Saturday from 8 p.m. to 2 a.m. 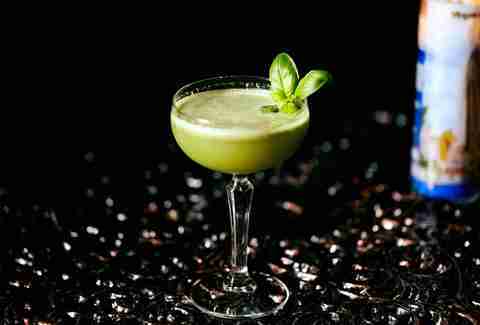 If the W didn’t have an aura of upscale exclusivity before, the Secret Bar seals the deal. Open from 4:30 p.m. until late every day, the lounge has its own bar, along with a vintage McIntosh sound system, gorgeous both to look at and listen to. How to get in: Enter through the Records Room in the W’s Living Room Bar, and congratulate yourself. You’ve officially gone down the rabbit hole. Anastacia Uriegas is a writer whose favorite secret bar is the one in her bathtub. Follow her shower Zima shenanigans at @anaurie.